FAYETTEVILLE, ARKANSAS – Webster University is moving. Webster, which has held classes in Fayetteville for the past 20 years and in the same location for the past decade, will relocate 20 miles north to the Center for Nonprofits at St. Mary’s in Rogers, Arkansas so that it can better serve the students and the community. The new location opens tomorrow, Aug. 7, 2018. Webster has a long history of responding to the needs of communities, Gibbs said, and it was determined that those who lived or worked more than 30 minutes north of Fayetteville had difficulties in accessing graduate programs that easily accommodated a working person’s schedule. Currently, Webster offers four master’s programs on site: an MBA, a master’s in Human Resources, a master’s in Management and Leadership, and a master’s in Finance which can also be earned as a dual Finance-MBA degree. Besides the on-site classes, Webster’s Arkansas program also offers 13 graduate and undergraduate degrees through its online classrooms. The new location is at 1200 West Walnut St., Suite 1300, Box 29, Rogers, Arkansas, 72756. Classes will start at that location during the week of Aug. 20, the start of Webster’s fall term. Webster chose this summer to make the move from Fayetteville as its 10-year lease for the current location expires in September. Webster University has been serving Northwest Arkansas for nearly 20 years. For more information about Webster’s educational offerings in Arkansas, visit webster.edu/NWArkansas, or call the new office at 479-571-1511. 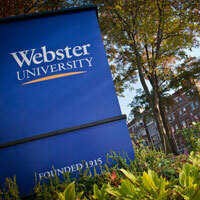 With its home campus in St. Louis, Missouri, USA, Webster University (www.webster.edu) comprises an action-oriented global network of faculty, staff, students and alumni who forge powerful bonds with each other and with their communities around the globe. Founded in 1915, Webster is a private non-profit university with nearly 14,000 students studying at campus locations in North America, Europe, Asia and Africa and in a robust learning environment online. The university is committed to ensuring high-quality learning experiences that transform students for global citizenship and individual excellence.